A regal trio of blue macaws is gathered on the treetops, overlooking a mysterious volcanic seacoast. The anthuriums and orchids add texture and color to a wide palette of greens and blues used by the artist to emphasize the richness of the rainforest vegetation. "View of the Cloud Forest"
Combines all the elements of a true Salinero masterpiece. It depicts a majestic quartet of scarlet macaws reigning over a luxurious canopy of exotic foliage in the heart of the tropical rainforest. In the foreground bright sunny heliconias and ethereal orchids contrast beautifully against the many shades of green, whereas the background offers a glimpse of the vast and mysterious rainforest as the sun rises over the hills. Many surprises await the careful viewer: geckos, frogs, bugs and butterflies hide among the foliage - like little rewards for taking the time to discover them. Two colorful Amazon parrots are nesting among lush philodendron leaves, enjoying the perfect stillness of the quietest time of day in the rainforest. In the background, as dusk is setting over a quiet beach, the warm glow of the sun casts glorious hues of pink, orange and purple in the sky. One of Sal Salinero's most recognizable pieces. A stunning trio of graceful blue and gold macaws is perched on a high branch overlooking the tropical rainforest on the Hawaiian island of Kauai. The luxurious vegetation surrounding the colorful birds is a careful rendition of the actual flora of the islands: bromeliads, devil's ivy, rubber tree plants and orchids thrive in the humid climate and create a lush tropical paradise that never ceases to inspire Mr. Salinero. 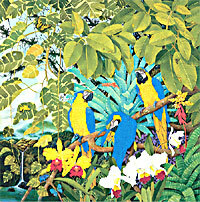 A true Salinero classic in which the artist has combined all the themes that have made him famous: the sumptuous blue and gold macaws, the luxurious foliage and the mysterious tropical rainforest. The viewer's eye is taken from the detailed orchids and tiny insects in the immediate foreground, to the faraway hills of the rainforest. In between, the great and majestic macaws seem to have gathered there for some very important meeting and preside over an enchanting valley with a fresh and cascading waterfall. 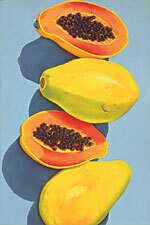 Truly a hymn to the vibrant and colorful tropical flora so close to the heart of the Key West born artist. An avid gardener himself, Sal Salinero has tended to many of the plants depicted in his work, and his ability to capture their essence comes directly from his sensitivity as a devoted gardener. Heliconia, pink ginger, torch ginger and cattleya orchids gather in a splendid composition to create a triumphant symphony of colors. 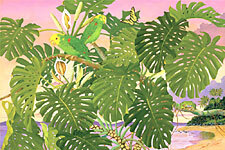 The original oil painting "Floral Tapestry" was donated to the Key West Horticultural Society, which is a non-profit organization whose goal is to protect and promote an appreciation of the flora of the Florida Keys. A poetic evocation of the beautiful sunsets of the Florida Keys. A graceful trio of great blue herons gather under a luxurious canopy of fragrant Angels’ trumpets in full bloom. The sun’s very last rays of the day ablaze the sky over the ocean in a glorious symphony of gold. Time seems to be at a standstill, as if caught at a moment of absolute perfection by the artist. As often in Salinero's work, whimsical surprises such as small frogs, butterflies and insects are to be discovered by the attentive viewer. 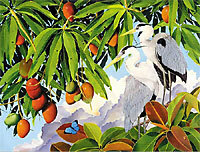 "Great Blue Herons and Mangos"
A beautiful rendition of two of Sal Salinero's favorite subject matters combined: birds and tropical fruit. A graceful pair of blue herons seem to covet the abundant ripening mangos that hang and swing gently from above. The clouds in the crisp blue sky behind them suggest a beautiful and breezy afternoon in a lush tropical paradise, as captured with great realism by Salinero’s extraordinary talent. 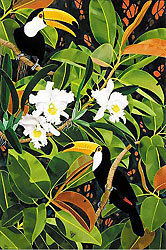 "Scarlet Plumage and Schefflera Blooms"
"Ibis Among the Orchids" & "Scarlet Plumage and Schefflera Blooms"
Throughout these two images there is remarkable attention to detail; beautifully painted flowers, foliage and the colorful tropical birds that the artist loves to paint. His sensitivity and ability to capture the nuances of reflected light have earned him an enviable position among Florida's art community. Mr. Salinero's realistic painting style initiates the viewer into the mysteries of the rainforest - from the canopy to the ground - with an accessibility and directness that enables one to imagine that one is actually there. With his work Salinero leaves us with a sharp appreciation of its beauty, as well as indicating everyone's responsibility to help save it. Mr. Salinero hopes that by painting the rainforest, it will arouse people's awareness and create a greater effort to stop its destruction. In "Ibis among the Orchids," against a backdrop of a vivid indigo sky, three graceful ibis are perched in the branches of a ficus tree. Elegant cattleya orchids and philodendron wind their way through the piece creating the ambiance of a lovely tropical paradise. The companion piece to the above is "Scarlet Plumage and Schefflera Blooms," which depicts scarlet macaws, the brilliant jewels of the jungle, preening their crimson plumage among the schefflera blooms in the mystical tropical rainforest. A tiger swallowtail butterfly completes this glimpse into the highest reaches of the jungle canopy. Toucans are seen perched among luxurious tropical foliage. They seem to have joined the sun's light in a playful dance around a beautiful trio of white orchids. Their oversized bills and friendly winks in their eyes emphasize their cockiness, as they invite you to share the intense beauty of their tropical paradise. Copyright Sal Salinero and Birn Fine Art - These images and/or designs are protected under United States Federal and International copyright laws and regulations. Any use or reproduction of these images and/or designs for any purpose whatsoever without express written permission of Sal Salinero and Birn Fine Art is prohibited. All rights reserved.